Roman sailors reached the northern region of "THULE", actually called "Iceland". This is what is increasingly believed in the last decades, after the discovery of some roman coins and other things related to the presence of Rome in this artic island-nation. Roman Plinius wrote in the first century on his famous "Naturalis Historia" that: "The most remote of all ...is Thule , in which, as we have previously stated , there is no night at the summer solstice, when the sun is passing through the sign of Cancer, while on the other hand at the winter solstice there is no day. Some writers are of opinion that this state of things lasts for six whole months together....At one day's sail from Thule is the frozen ocean, which by some is called the Cronian Sea." Of course these precise data confirm that the Romans had a good geographical knowledge of Thule/Iceland. Indeed six Roman coins stamped with the portrait of Roman emperors have been found on Iceland and they are at the center of academic discussions about the Roman presence in this nation-island near Greenland and the North Pole. *The first is that they were brought to Iceland in Roman times; the second that they were brought after the collapse of the Western Empire, either in the sixth or, say, the sixteenth century. A Roman visit to Iceland is not in itself impossible. The Romans recognized a land to the north of Britain called Thule and this might very possibly have been Iceland to judge by Ptolemy’s reference. But there are two big problems with the Roman explanation for these coins. (1) we are talking about multiple rather than single visits given the spread of the coins (or some mechanism by which coins from a single visit were spread around) and (2) why would Romans even take coins out of their pockets in Iceland given that there was no one to trade with? It might also be worth adding that Roman visits to ultima Thule may have been an imperative of the Roman policy of exploration and mapping in the north: but that regular trips to Iceland would have been made more difficult given that what is today Scotland, Orkney, Shetland and Faeroe were all, essentially, hostile territory. *The second possibility is that someone else brought the coins to Iceland after the collapse of the Empire. Candidates have included the Vikings, the Irish monks who came to live hermit lives in Iceland and modern fakers like "mad coin-burying Halliday". Modern fakers may have been responsible for a couple of the coins, but the spread of five means either five different fakers or a very systematic single faker. Note too that one of the coins was found by a noted Icelandic archaeologist at a Viking site: Thor Magnusson. And, in fact, the best explanation is given by the Vikings because bronze Roman coins have been found in early medieval and Viking age Scandinavian sites, where they seem to have been recycled as currency. Additionally, it is interesting to note that the five coins cover a relatively short range: one that is as narrow as forty years at the end of the fourth century. Another interesting characteristic of these coins is that they are not found in the same place, but in different and distant sites of southern Iceland. "The farm of Bragavellir lies near the sea at the bottom of the Hamarsfjörur fjord. Between the mountain Mimundarfjall and the hills of Bragavallahólar southeast of the farm is a small valley; The bottom of the valley is generally plain but lowers in the east – or northeast, where the river Selá runs under Bragavallahólar to the east. In the middle of the valley, which is called Djúpibotn, just south of the ascending mountain is a small mount overgrown with heather. On the north-eastern slope, however, all vegetation has been blown away by the wind, revealing the rocky surface, though some vegetation is slowly beginning to reappear. Around the beginning of the past century Jón Sigursson, farmer from Bragavellir, bagan to find ancient remains in this windblown area”. 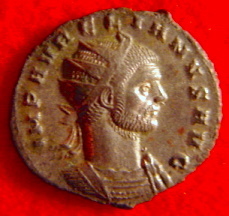 Indeed in 1933 the coin of Aurelianus (A) was found within the same area and was sent to the National Museum along with various other finds, which had been collected over the years. Shortly afterwards the state antiquarian, Matthías Orarsson, arrived at Bragavellir to conduct an archaeological survey. Unfortunately the tough weather conditions had obliterated most traces that might have been left of the purported settlement, although Orarsson did identify the remains of a construction made from mountain rock stones. The recorded finds from Bragavellir mostly consist of small fragments of worked stone and iron objects, glass beads, and teeth from cattle. The material is of the traditional Iron Age type recorded within Viking age contexts in Scandinavia. During the summer periods of the years 1963 to 1967, archaeological excavations were carried out on the land of the Hvítárholt farmstead. The site had yielded several Viking Age structures and artefacts. During the 1966 season, while excavating a house, the field supervisor, Thór Magnússon, discovered the second "Antoninianus" (B). The coin was located inside house no. VIII, which was one of the largest at the site and reckoned to be the second oldest. In his report, Magnússon stated that the coin was covered with verdigris, yet very well preserved, having suffered only minor corrosion. The circumstances surrounding the discovery of the Diocletian "Antoninianus" (D) was done by Mr. Leonard Hawkes, a British college teacher and practiced geologist, who had travelled to Iceland in order to study the island’s topography and geology. Before his return to England, Hawkes handed over the coin to the National Museum in Reykjavik, where it is still kept and on display. Allegedly, the first Dupondius (E), probably minted during the reign of Phillip the Arab, was found at the Skansinn renaissance fort in the Westman Islands off the south coast of Iceland. Claiming to have found the coin lodged between the building blocks, the discoverers handed the Dupontius over to the National Museum. This was in 1991, since then, however, only minuscule scholarly interest has been shown this Roman coin because of the great uncertainty regarding the time of deposition. It is impossible to assert both how and when the coin ended up within the wall construction, and for all we know it could be a hoax. Likewise, the badly corroded Dupondius (F) can be a hoax. In 1993, excavation and remodelling of the Arnarhóll mount was being carried out in the centre of Reykjavík. The coin was discovered inside the remains of an 18th–19th century house, though in his report the field supervisor expresses certain doubts concerning the authenticity of the find, noting that it could have been planted while excavation was in progress. The first scholar to study the coins, attempting to assess the origin of the coins, was Kristján Eldjárn, former state antiquarian and president of Iceland. In three articles written in the years 1948-51. Eldjárn introduced his ideas regarding the origin of the coins. He is convinced that the 3 coins found at the east coast of Iceland must have been transported to the country in the same purse. The coins were discovered within the area of Bragavellir, in a location containing several remains of Viking Age activities. However, Eldjárn considers it highly unlikely that the coins should have been brought to Iceland from Scandinavia during the Viking Age. According to his comprehensive studies, the quantity of "Antoniniani" found within the Scandinavian countries is so scant that the probability of the coins being transported to Iceland with Norsemen is highly unlikely – if not unthinkable. Instead, he suggests that the coins must have travelled from Roman Britain onboard a boat driven off course by stormy weather. Eldjárn tells of Carausius’ rule over Britain and how this specific period was the golden age of Rome as the supreme naval power, particularly in the waters of the English Channel. In his book from 1956, Eldjárn reaches the same conclusion. In the 1951 issue of "Antiquity" magazine an article by F.M. Heichelheim was published, supporting Eldjárn’s belief that the coins had arrived in Iceland during Roman times, around the year 300. However, Heichelheim did not support Eldjárn’s idea that these sailors were Roman soldiers. Instead, he was more convinced that the sailors had been Scandinavian or Saxon pirates, who had served in the Roman military in the Danube regions, or perhaps in the Orient. He argues that a large number of Germanic men were employed within the Roman army during the last years of the 3rd century, mostly serving within the Danube area. Receiving payment in Roman coins for their services, any one of these Germanic men could have brought the Roman coinage on a journey to Iceland. He supports his theory that soldiers from Carausius' navy would most likely not been paid with coins minted in Rome or Asia Minor but with coins minted in Gaul or Britain. The theory is in many ways very good, and well supported. The main points that support the theory are the following: Firstly, general/emperor Carausius and his Romans were attacking Saxon pirates in the Channel. As many ships were sailing around Britain at the time there is is the possibility of one ship getting caught in a storm and by accident sailed towards the north. Secondly, the ships of the Roman times were definitely able to withstand the sail over the Atlantic. The Roman merchant ships were in many ways not very different from schooners used in the late middle age that sailed over the Atlantic to the USA and back in the 16th and 17th century. Thirdly, the soldiers on Carausius’ ships were a part of the Roman Navy and therefore got paid in Roman coins before the split from Rome. Fourthly it is known from written sources that learned men of the time could well have known of the land in the north, called Thule. Firstly, the ships used in roman warfare were not made for sailing on open sea. They mostly relied on oars to maneuver the ships and only had a small sail to move the ship out of battle if to many oars were disabled. These ships kept close to the shore and storms would most likely not get these ships to stray of course like ships sailing on the open sea. Secondly, according to R. Reece it looks like Britain was isolated from the roman monetary supply in the 3rd century, because of military and political reasons. There are still some Denarii found in roman Britain in those decades, most likely because of payment to the military. Thirdly, there are no known historical sources that tell of any ship sailing north of Iceland. Fourthly, there is the account of mr. Heichelheim about the origin of the coins where he states that these coins were a seldom sight in Britain at the time of Carausius. After reviewing these facts it seems unlikely, according to David Heidarsson, that these coins came from a Roman ship from the years 287-296 AD as mr. Eldjárn suggests. But it is still a concrete possibility and can be studied and probably accepted as true, if further discoveries will happen in the future and confirm it. I sincerely don't believe that the Vikings brought some Roman coins to Iceland when they conquered and colonized it. They simply did not need any ancient coin in a so remote area of north Europe. The Vikings from Norway were barbarians who rarely used those Roman coins (even in their country) and they did not need to hoard them in an island that was surviving mainly on primitive agriculture and fishing in those medioeval centuries. They could only have found these very few coins and labeled as a special kind of strange "jewelry" from the ancient civilized world. * the first is that a roman ship was stranded in the waters north of Scotland (probably during Carausius times in the third century) and the sailors who owned the coins survived on Thule. After many years those coins were discovered by others, like Irish eremites or Viking settlers. * the second is that Irish monks from the British isles in the sixth/seventh century brought to Iceland with themselves the coins, for possible use as exchange of food, dress, etc... And later the coins were discovered and perhaps used/hoarded by Viking raiders/settlers. And finally, I want to remember a third possibility, that is indeed very improbable (but to be considered "a bit" feasible): Carausius not only was in charge of a powerful Roman fleet in the British isles, but later he did also some piracy in his fight for power. So, he could have created a "refuge" in Thule (like pirates did in remote islands of the Caribbean centuries later) for his safety from Rome, after he created his secessionist "Britannia empire" with his 'Carausian Revolt'. And in this pirate's refuge could have circulated some Roman coins........anyway, here we are totally in the world of possible explanations based on every kind of theories! Very interesting article. I wonder if somebody reached Greenland before the Vikings. Did you know that you can create short urls with AdFly and make money for every visitor to your short links.